What do you do when your village is not connected to the main electricity grid, but you have a waterfall nearby? 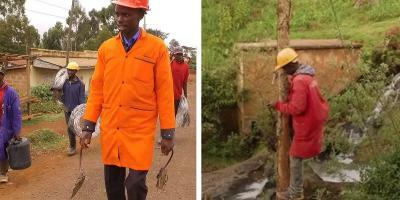 John Magiro is an unsung hero from a small village in Murang’a county, Kenya. After seeing his mother struggle, he decided to build a hydropower station using everyday objects, including a dynamo and a bicycle rim. Despite failing his exams at school, Magiro has successfully produced power for over 350 households. As a child, Magiro used a kerosene lamp to study in the evening. The kerosene would often run out which meant that he had to walk almost one kilometre to buy more fuel. Due to lack of school fees, Magiro was sent home from school. He used this time to work on his turbine power plant project which has turned out to be a huge success. Magiro charges a standard fee of $2 a month and the electricity generated is now being used by many people in the village. Across sub-saharan Africa an estimated 621 million people do not have access to electricity. Magiro is now determined to power thousands of homes. “In Kenya, we have a lot of waterfalls that are not being used. If I can start mini Magiro Hydropower stations, it will serve the communities around these falls.” he said.